Will not be accessing data or content from a central office server or shared online folder. Do you need a Multi-User installation instead? We generally recommend a Multi-User installation – especially in offices with multiple Land F/X users. Even if you are actually a single user (such as a sole proprietor), we still recommend a Multi-User installation, which will allow you to store your LandFX folder in a safe place and access it from additional computers such as a home computer or laptop. See our Multi-User installation steps. We recommend Cloud Data if you have a fast and reliable Internet connection. It's also a great option if you plan to work remotely or on a home computer or laptop. If you do not have a reliable Internet connection, we recommend selecting Local Data. Will have F/X CAD installed on it and does not already have AutoCAD installed. These steps will help you install Single-User Land F/X using our Cloud Data option. If you have a reliable Internet connection, we recommend Cloud Data. Otherwise, use the Local Data installation steps instead. 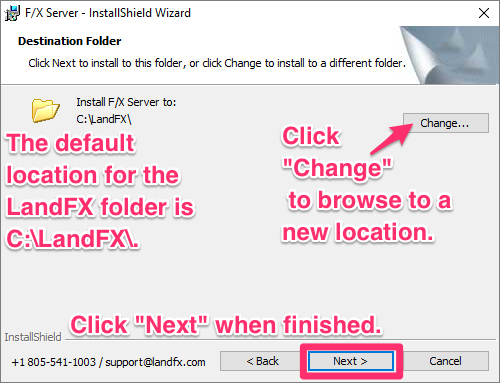 During the Destination Folder step, you will be asked where to install the LandFX folder. Our installer will create this folder automatically in the location you choose. The default option is C:\LandFX – the C: drive on your computer. You can choose this location or click Change to browse to a new location. Click Next when finished. Installing on an office server? If so, you should be using our Multi-User installation steps. What is the LandFX folder, and where should you store it? Select the version of CAD you plan to use with Land F/X: AutoCAD or F/X CAD. What's F/X CAD? It's our genuine Autodesk AutoCAD engine, which we're able to offer to Land F/X users at a reduced price. Click Next once you've made your selection. If you selected AutoCAD, move on to the next step to choose your version of AutoCAD. If you selected F/X CAD, you'll be brought to our F/X CAD installation steps when the installer completes. Already have the correct version of F/X CAD installed? Select the AutoCAD option. Then click Next to load your Land F/X menus into CAD and complete the Land F/X installation. These steps will help you install Single-User Land F/X using our Local Data option. If your office does not have a reliable Internet connection, you should be using these steps to install Land F/X. For most offices, we recommend the Cloud Data installation steps.